Penn’s Girls Soccer Team, ranked No. 1 in Class 3-A, won a hard-fought match against No. 5 (Class 2-A) South Bend St. Joseph, 2-0, on Wednesday, Sept. 20. 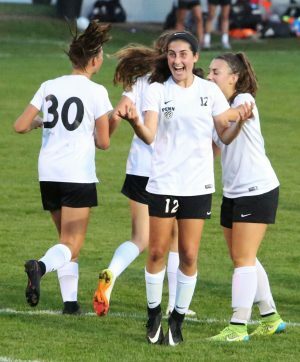 In the 42nd minute, Maya Lacognato scored a header goal off an assist from Florida State University commit Kristina Lynch to put the Kingsmen on the scoreboard. Lynch struck in the opening minutes of the second half to give Penn its 2-0 lead. The Kingsmen move to 13-0-1, 7-0 in Northern Indiana Conference play.